[S11] Index to Texas Death Records (Austin, Tex. : Tex. Dept. of Health, Bur. of Vital Statistics), typescript, 1957, vol. 1, p. 354, file 24969. [S686] Virginia Provost, electronic mail to Roger Bartlett, 22 Oct 2001 (naming John M. White as her father). [S686] Virginia Provost, electronic mail to Roger Bartlett, 22 Oct 2001 (naming William Baylor as her father). [S750] Margaret Sturges, "James Robert Bell, Jr.," in The Dewitt County Hist. Comm., The History of Dewitt County, Texas (n.p. : Curtis Media Corp., 1991), pp. 280-81 (naming William Baylor as her father). [S686] Virginia Provost, electronic mail to Roger Bartlett, 22 Oct 2001 (naming Rhoda Mariah Burks as her mother). [S750] Margaret Sturges, "James Robert Bell, Jr.," above (naming Rhoda Mariah Burks as her mother). [S961] Find A Grave, online at http://www.findagrave.com, memorial for Willie Emily Baylor Bell, memorial no. 60922525, viewed on 26 Apr 2017. [S750] Margaret Sturges, "James Robert Bell, Jr.," above. [S750] Margaret Sturges, "James Robert Bell, Jr.," above (identifying the cemtery as City Cemetery, Cotulla, La Salle County, Texas). [S686] Virginia Provost, electronic mail to Roger Bartlett, 22 Oct 2001 (stating that she died in 1955 in Cotulla, Texas). [S750] Margaret Sturges, "James Robert Bell, Jr.," above (giving only the year and not naming the place). [S11] Index to Texas Death Records (Austin, Tex. : Tex. Dept. of Health, Bur. of Vital Statistics), typescript, 1946-55, vol. 2, p. 699, file 19209 (giving the date, county, and state). [S686] Virginia Provost, electronic mail to Roger Bartlett, 22 Oct 2001 (naming Willie Emily Baylor as his mother). [S750] Margaret Sturges, "James Robert Bell, Jr.," above (naming Willie Emily Baylor as his mother). [S750] Margaret Sturges, "James Robert Bell, Jr.," above (naming Willie Emily Baylor as her mother). [S686] Virginia Provost, electronic mail to Roger Bartlett, 22 Oct 2001 (naming Willie Emily Baylor as her mother). Marriage*: He married Rhoda Mariah Burks. Marriage*: She married William Baylor. [S750] Margaret Sturges, "James Robert Bell, Jr.," in The Dewitt County Hist. Comm., The History of Dewitt County, Texas (n.p. : Curtis Media Corp., 1991), pp. 280-81 (naming Rhoda Mariah Burks as her mother). [S750] Margaret Sturges, "James Robert Bell, Jr.," in The Dewitt County Hist. Comm., The History of Dewitt County, Texas (n.p. : Curtis Media Corp., 1991), pp. 280-81 (naming James Robert Bell, Jr. as his father). [S750] Margaret Sturges, "James Robert Bell, Jr.," above (not giving the date). [S11] Index to Texas Death Records (Austin, Tex. : Tex. Dept. of Health, Bur. of Vital Statistics), typescript, 1972, vol. 1, p. 104, file 46415. [S312] Social Security Death Index, online at http://tinyurl.com/AncestrySSDI, viewed on 9 May 2004 (stating that he died in Jun 1972 without naming the place). [S750] Margaret Sturges, "James Robert Bell, Jr.," in The Dewitt County Hist. Comm., The History of Dewitt County, Texas (n.p. : Curtis Media Corp., 1991), pp. 280-81 (naming James Robert Bell, Jr. as her father). [S312] Social Security Death Index, online at http://tinyurl.com/AncestrySSDI, viewed on 27 Oct 2001 (giving only the date). [S312] Social Security Death Index, online at http://tinyurl.com/AncestrySSDI, viewed on 27 Oct 2001 (not naming the place of death but stating that she lived in Cotulla, Tex. when she died). [S579] Texas Death Records, online http://vitals.rootsweb.com/tx/death/search.cgi, viewed on 27 Oct 2001. [S686] Virginia Provost, electronic mail to Roger Bartlett, 22 Oct 2001 (naming Victor J. Grunder as her father). [S686] Virginia Provost, electronic mail to Roger Bartlett, 22 Oct 2001 (naming Augusta Keller as her mother). [S686] Virginia Provost, electronic mail to Roger Bartlett, 22 Oct 2001 (naming Gertrude Joan Grunder as his mother). [S752] Rosemary Kokernot, "John J. Bell," in The Dewitt County Hist. Comm., The History of Dewitt County, Texas (n.p. : Curtis Media Corp., 1991), pp. 281-82. (naming Gertrude Grunder as his mother). Marriage*: He married Augusta Keller. 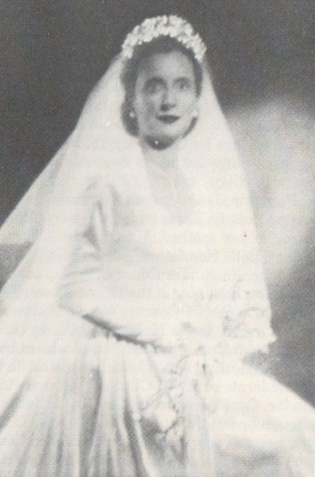 Marriage*: She married Victor J. Grunder. 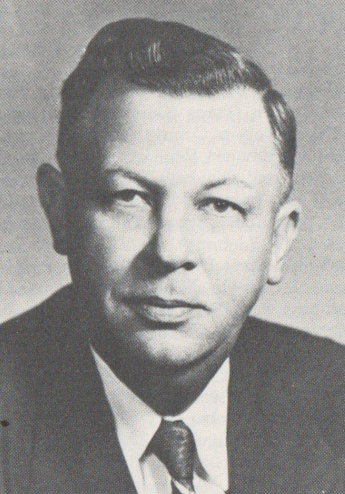 John Junior Bell, from The History of DeWitt County, Texas. [S961] Find A Grave, online at http://www.findagrave.com, memorial for John York Bell, memorial no. 93104213, viewed on 11 Jun 2016 (naming John York Bell as his father). [S752] Rosemary Kokernot, "John J. Bell," above (naming Gertrude Grunder as his mother). [S687] Biography of John Junior Bell, Biographical Directory of the United States Congress, online at http://bioguide.congress.gov, viewed on 27 Oct 2001. [S752] Rosemary Kokernot, "John J. Bell," above. [S961] Find A Grave, online, above, memorial for John Junior Bell, memorial no. 6814637, viewed on 26 Apr 2014 (giving the date but not the place). [S961] Find A Grave, online, above, memorial for John Junior Bell, memorial no. 6814637, viewed on 26 Apr 2014 (not giving the date). [S961] Find A Grave, online, above, memorial for Mabel Claire Breeden Bell, memorial no. 93103860, viewed on 26 Apr 2014. [S312] Social Security Death Index, online at http://tinyurl.com/AncestrySSDI, viewed on 27 Oct 2001 (stating that he died in Jan 1963 and not naming the place). [S687] Biography of John Junior Bell, Biographical Directory of the United States Congress, online at http://bioguide.congress.gov, viewed on 27 Oct 2001, (giving the date without naming the place). [S11] Index to Texas Death Records (Austin, Tex. : Tex. Dept. of Health, Bur. of Vital Statistics), typescript, 1963, vol. 1, p. 91, file 1949 (giving the date, county, and state). [S961] Find A Grave, online, above, memorial for John Junior Bell, memorial no. 6814637, viewed on 26 Apr 2014. 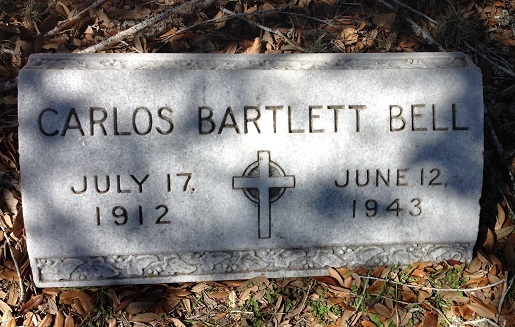 Carlos Bartlett Bell's tombstone, Hillside Cemetery, Cuero, Tex., courtesy of Cindy S. Munson. • His Find A Grave memorial, which includes a picture of his death certificate, is here. [S1334] Standard certificate of death (Texas Department of Health, Bureau of Vital Statistics) no. 28390 for Carlos Bartlett Bell, filed with local registrar on 1 Jul 1943, John Y. Bell, informant, per copy pictured on memorial for Carlos Bartlett Bell, memorial no. 93104417, http://www.findagrave.com, viewed on 11 Jun 2016. [S686] Virginia Provost, electronic mail to Roger Bartlett, 22 Oct 2001 (giving the date but not the place). [S11] Index to Texas Death Records (Austin, Tex. : Tex. Dept. of Health, Bur. of Vital Statistics), typescript, 1941-45, vol. 1, p. 354, file 28390. [S961] Find A Grave, online, above, memorial for Carlos Bartlett Bell, memorial no. 93104417, viewed on 11 Jun 2016. [S312] Social Security Death Index, online at http://tinyurl.com/AncestrySSDI, viewed on 28 Oct 2001 (not naming the place of death but stating that he lived in Houston, Tex. when he died). [S579] Texas Death Records, online http://vitals.rootsweb.com/tx/death/search.cgi, viewed on 28 Oct 2001 (giving the date and naming the county but not the town). [S750] Margaret Sturges, "James Robert Bell, Jr.," in The Dewitt County Hist. Comm., The History of Dewitt County, Texas (n.p. : Curtis Media Corp., 1991), pp. 280-81 (not giving the date). [S312] Social Security Death Index, online at http://tinyurl.com/AncestrySSDI, viewed on 14 May 2006 (stating that she died on 15 Jun 2005; not naming the place of death but stating that she lived in Dallas, Texas when she died). [S312] Social Security Death Index, online at http://tinyurl.com/AncestrySSDI, viewed on 27 Oct 2001 (stating that he died in Sep 1972; not naming the place of death but stating that he lived in Cotulla, Tex. when he died). [S686] Virginia Provost, electronic mail to Roger Bartlett, 22 Oct 2001 (stating that he died in 1972 but not naming the place). [S750] Margaret Sturges, "James Robert Bell, Jr.," above (stating that he died in 1972 but not naming the place). [S686] Virginia Provost, electronic mail to Roger Bartlett, 22 Oct 2001 (giving only the year). [S312] Social Security Death Index, online at http://tinyurl.com/AncestrySSDI, viewed on 27 Oct 2001. [S312] Social Security Death Index, online at http://tinyurl.com/AncestrySSDI, viewed on 27 Oct 2001 (stating that he died in Apr 1973 but not naming the place). [S686] Virginia Provost, electronic mail to Roger Bartlett, 22 Oct 2001 (stating that he died in 1973 but not naming the place). [S750] Margaret Sturges, "James Robert Bell, Jr.," in The Dewitt County Hist. Comm., The History of Dewitt County, Texas (n.p. : Curtis Media Corp., 1991), pp. 280-81 (giving only the year and not naming the place). Mabel Claire Breeden Bell. from The History of DeWitt County, Texas. Other Names*: Mabel Claire Breeden Bell, Mabel Breeden Bell, Mabel Claire Bell, Mabel Breeden, Mabel Bell. • Her Find A Grave memorial, which includes pictures of her death certificate, is here. [S752] Rosemary Kokernot, "John J. Bell," in The Dewitt County Hist. Comm., The History of Dewitt County, Texas (n.p. : Curtis Media Corp., 1991), pp. 281-82. (naming Charles Goodwin Breeden as her father). [S961] Find A Grave, online at http://www.findagrave.com, memorial for Mabel Claire Breeden Bell, memorial no. 93103860, viewed on 26 Apr 2014 (naming Charles Goodwin Breeden as her father). [S961] Find A Grave, online, above, memorial for Charles Goodwin Breeden, memorial no. 18504603, viewed on 26 Apr 2014 (naming Charles Goodwin Breeden as her father). [S961] Find A Grave, online, above, memorial for Mabel Claire Breeden Bell, memorial no. 93103860, viewed on 26 Apr 2014 (naming Mabel Claire Hall as her mother). [S961] Find A Grave, online, above, memorial for Mabel Claire Breeden Bell, memorial no. 93103860, viewed on 11 Jun 2016. [S312] Social Security Death Index, online at http://tinyurl.com/AncestrySSDI, viewed on 27 Oct 2001 (stating that she died in Feb 1983; not naming the place of death but stating that she lived in Cuero, Tex. when she died). [S752] Rosemary Kokernot, "John J. Bell," above (first bullet).